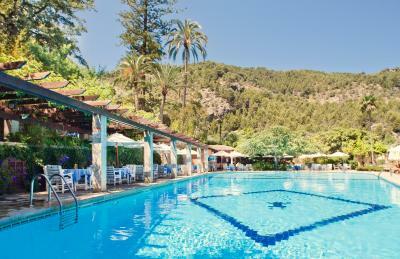 Lock in a great price for Es Moli – rated 9.1 by recent guests! I liked the property as a whole with great location close to the small town. Majority of the staff was helpful. Nice and comfortable rooms. Great choice of restaurants. Great variety of food for breakfast. The private beach was incredible! Although it was a long drive from hotel but well worth the drive!! The hotel does provides a shuttle to private beach and back. The beach has its own restaurant and bar. 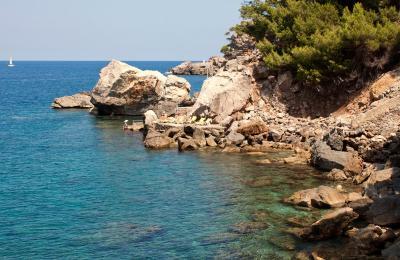 It is on a rocky rugged coast (so no sand) and they provide water toys and snorkels. The grounds of the hotel are spectacular! There are so many secluded places to lounge. Truly remarkable grounds! Close, easy stroll into town along a nice pathway. 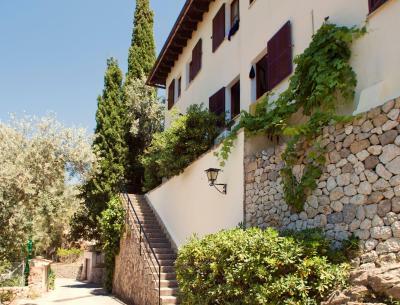 This hotel is ideally located for active travellers, hikers and cyclists. We have also seen many folks that simply wanted a private , more relaxed atmosphere. Breakfast is first class, accommodations great, proximity to the beach is solved with a regular hotel organized shuttle. 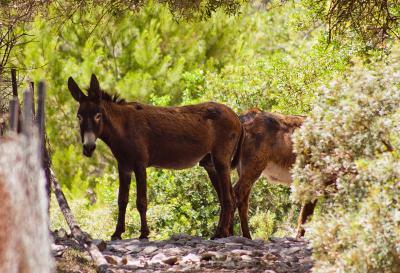 From here we made daily trips to other beautiful villages in the Tresmuntana mountains. What a great trip. The property was brilliant in every way - just one of the nicest spots we’ve ever stayed at, measured up to our expectations and more. The private swimming cove 7 miles away from the property that’s accessed by a free shuttle bus several times a day is breathtakingly beautiful. Absolutely don’t miss it. 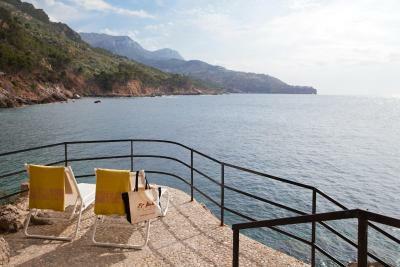 Everything: amazing breakfast, incredible charm and character of the place, sttunning view on the sea and Deia village, beautiful garden, baby friendly facility (baby bed and baby bath in the room without even asking for it, baby seats available everywhere, ...). I would definitely recommend this place. The architecture and gardens are superb. The private cove is beautiful. Meals on the terrace were extremely pleasant. 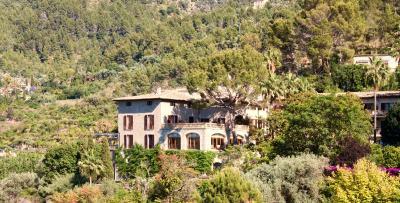 Loved the property and staying in Deia. Lovely little town. Good breakfast buffet. Stunning property in perfect setting and ideal town. Hope to return again and again. Es Moli This rating is a reflection of how the property compares to the industry standard when it comes to price, facilities and services available. It's based on a self-evaluation by the property. Use this rating to help choose your stay! 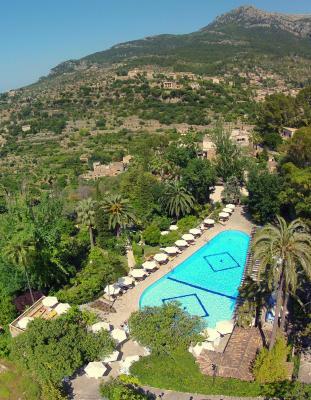 One of our top picks in Deia.On a hilltop in northwest Majorca, Es Moli is in a 17th-century mansion with panoramic views of the sea, Deià village and the Tramuntana Mountains. 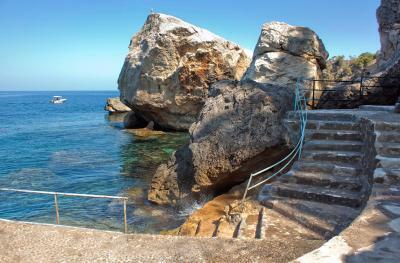 It has an outdoor pool and a private, exclusive rocky cove. Each room includes satellite TV and a DVD player, as well as tea and coffee-making facilities. All the well-equipped bathrooms have bathrobes, slippers and beach towels. 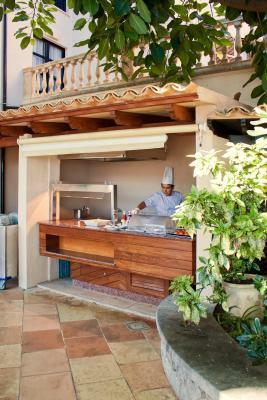 The restaurant at Es Moli Hotel has a terrace offering great views of the countryside and themed dinner evenings. There are also 2 bars serving drinks and light meals. 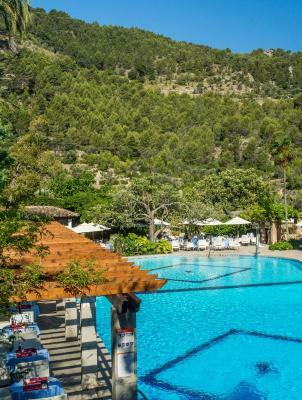 Recreational facilities at Es Molí Deia include a fitness center and tennis courts. The Es Moli Wellness features a wide range of massages, beauty and alternative treatments. 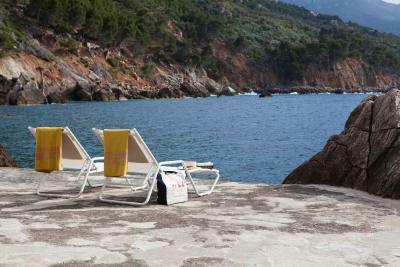 Four times a day, the hotel offers a free shuttle to its private beach, Sa Muleta. There you can find a beach bar, lounge chairs and snorkeling equipment. The private cove, just 5 miles away, is open from 10 am to 6 pm. 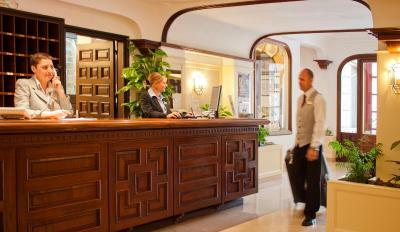 Palma de Mallorca and its airport are around a 30-minute drive from Hotel Es Molí. 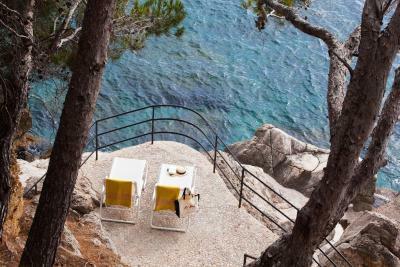 When would you like to stay at Es Moli? This room is on the first or second floor of the hotel's annex building, above the hotel grounds around 325 ft from the main building (including a climb of around 100 steps). It has satellite TV and a DVD player, as well as a minibar and tea and coffee-making facilities. The bathroom includes bathrobes, slippers and a hairdryer, as well as pool and beach towels. It has free Wi-Fi. Room service and extra beds are not available in this room type. In the main building of the hotel, this room has satellite TV and a DVD player, as well as a minibar and tea and coffee-making facilities. The bathroom includes bathrobes, slippers and a hairdryer, as well as pool and beach towels. 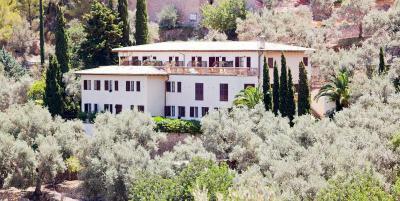 It has free Wi-Fi and views of the Mallorcan countryside. In the main building of the hotel, this room has satellite TV and a DVD player, as well as a minibar and tea and coffee-making facilities. The bathroom includes bathrobes, slippers and a hairdryer, as well as pool and beach towels. It has free Wi-Fi and a private terrace with views of the Mallorcan countryside. 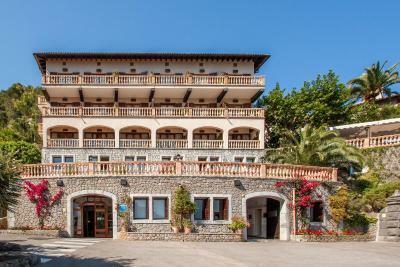 Offering sea, garden or mountain views and in the main building of the hotel, this room has satellite TV and a DVD player, as well as a minibar and tea and coffee-making facilities.The bathroom includes bathrobes, slippers and a hairdryer, as well as pool and beach towels. It provides free Wi-Fi. All junior suites have a terrace or balcony and a spacious sitting area. This room is on the third floor of the hotel's annex building, above the hotel gardens around 325 ft from the main building (including a climb of around 100 steps). This room has satellite TV and a DVD player, as well as a minibar and tea and coffee-making facilities. The bathroom includes bathrobes, slippers and a hairdryer, as well as pool and beach towels. 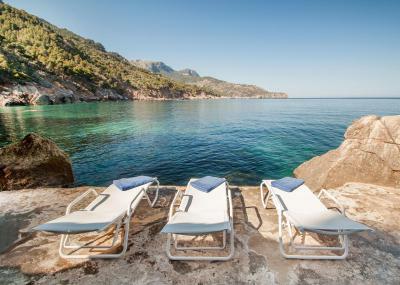 It has free Wi-Fi and a private terrace with views of the Mallorcan countryside. Room Service not provided in these rooms. In the main building of the hotel, this room has satellite TV and a DVD player, as well as a minibar and tea and coffee-making facilities. The bathroom includes bathrobes, slippers and a hairdryer, as well as pool and beach towels. 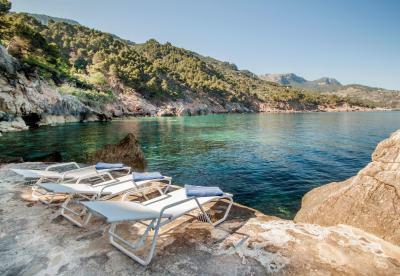 It provides free Wi-Fi and views of the Mallorcan countryside. Originally a 17th century manor house, converted into a hotel in 1965. 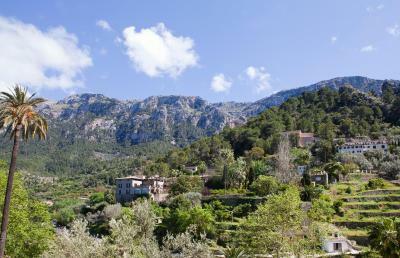 Embedded on a slope of the Serra de Tramuntana, declared World Heritage by UNESCO, and opposite to the village of Deià. 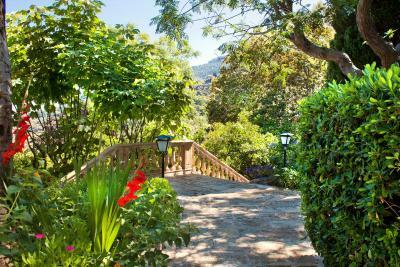 Es Molí is a true haven of peace and tranquillity in one of the privileged landscapes of the world. Location and service are our two highlighted assets. House Rules Es Moli takes special requests – add in the next step! Es Moli accepts these cards and reserves the right to temporarily hold an amount prior to arrival. In the restaurant in the evening long trousers are required for gentlemen. 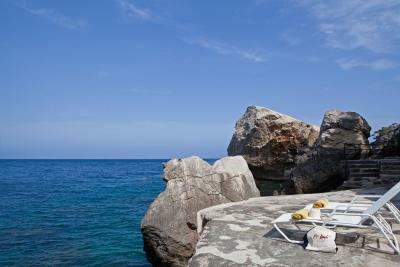 Hotel's "exclusive rocky cove" Sa Muleta is open from 10 am – 6 pm. Please note that the bar on the terrace opens every evening (except Mondays) from June until the end of September. 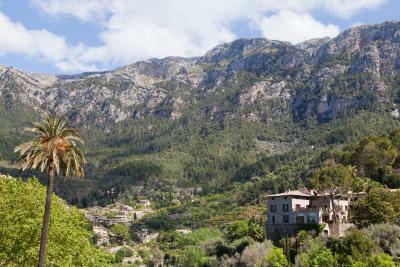 Beautiful location, quick walk into Deià. 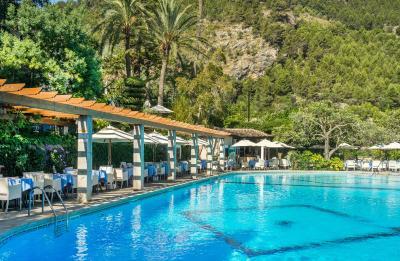 Friendly staff ( who were very helpful when I had to cut my stay short), lovely pool and no bagging of day beds by other visitors. Always day beds available. Food good. Will go back which I don’t often say about a hotel. The staff were too young and inexperienced. The position is lovely, however the walk to the village is hazardous. One felt the staff were doing you a favour rather than being proactive and charming.. Food was good. In summary, probably worth another try when the hotel is in full swing. The mat at the front door was looking a little worn. (this is a joke as I didn't come across any problems) Maybe just the noise of the chairs in the diner if sleeping above. Screeching on the floor. Thats all. 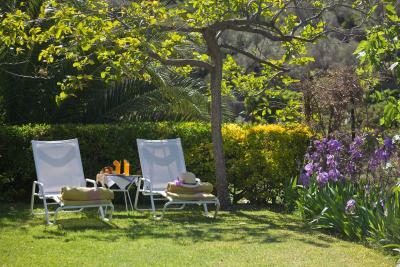 Location, staff, garden, cleanliness, quietness, pool, food ... was perfect ! We stayed in the annex, which is set behind the main building higher up on the hill. While we are quite fit and able, the hike up the hill was quite hard. However it was very peaceful in the annex so good for those who prefer a quiet part of the hotel. 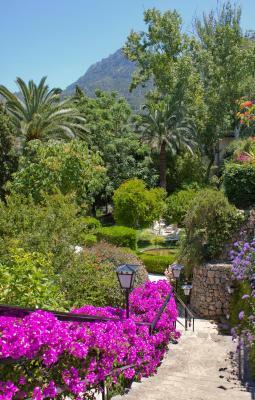 The best things about Es Moli: The garden was amazing - even though the hotel seemed pretty fully booked the gardens were quiet and spacious with little calm nooks to sit in with beautiful flowers and plants. The staff - so attentive and helpful with lots of tips for what to do see and do. The breakfast - probably the most comprehensive hotel breakfast we’ve ever experienced. Anything you might ever want for breakfast, even freshly made omelettes with fillings of your choice. Construction noise across road woke me up at 8am. Meals and dinks were quite expensive. Room a bit small. Some elements are a little dated but the hotel appears to be going through some upgrading so it’s not an issue. 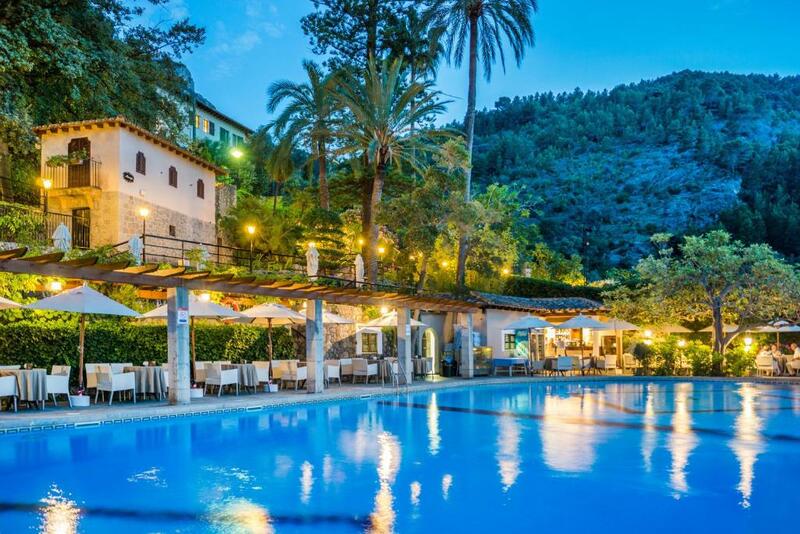 Immaculately clean old school hotel and gardens in a wonderful position and some of the best staff service I have ever had. Friendlyness of staff was first class. They couldnt do enough to help. Restaurant food was top quality. The cove wouldn't provide snorkeling gear (next week they said!) despite reception saying they would. We came in their off season and when asked about air conditioning we were told it had been turned off already. When booked, our room was described as being air conditioned. It was warm and uncomfortable. Their answer was to bring be in a rusty floor fan. Also, the beach cove is lovely, but not close. We drove ourselves and the road is very curvy and narrow. Not a drive I would want to redo. The staff was friendly and rooms a nice size. The balcony rooms are pleasant. Buffet breakfast was very nice. The pool is beautiful, but we experienced rainy weather so did not use it.